On August 25, 2011, our team had a players-only meeting. At that point in the year, our record was 67-63, and we stood 10 games behind the Brewers in the NL Central and 10.5 games behind the Atlanta Braves for the Wild Card spot. Our postseason chances did not look good and we knew it. Believe it or not, the meeting was not about making the playoffs or getting to the World Series. It was about having respect for our craft, and giving it everything we've got. In many ways, it was a similar approach these kids in the hospital would have. You keep fighting because ... why wouldn't you? At that point we were playing bad baseball, and we just looked sloppy. It wasn't like we weren't giving it our all, but it just didn't look like us. Over the last five weeks of the season, we started to play like the St. Louis Cardinals people had come to expect. The thing is, a playoff berth was still out of our control, because Atlanta was playing their own games. Fortunately, there's a Bible verse that is meant to put the mind at ease. "Therefore do not worry about tomorrow, for tomorrow will worry about itself," Matthew 6:34 says. "Each day has enough trouble of its own." In many ways, each pitch is a microcosm of that verse. Once the ball leaves my hand, it's literally and figuratively out of my control. All I can do as a pitcher is try and locate the spot with the right pitch selection and velocity, but after that point all I can do is watch the batter. There's no point in worrying about what the future holds. I think that lack of worrying helped us as we tried to chase down Atlanta. We chose not to look at the standings, but just focused on ourselves. We swept Atlanta in September, and then slowly clawed our way back. By the time game 161 had finished, we were tied in the standings. We put Chris Carpenter on the mound for the season finale, and he was absolutely shoving. It wasn't even fair. He pitched a two-hit shutout, and then we watched as the Phillies beat Atlanta in 11 innings. We were going to the playoffs! It wasn't the last time Carpenter came through for us in the clutch. The NLDS against the Phillies went to a decisive Game 5, and this time he pitched a 3-hit shutout to send us to the NLCS. We held a 3-2 series lead against the Brewers and with a 12-6 lead they sent me out to close the series. I was fortunate enough to get the three outs, and now we were going to the World Series. Unfortunately, all that seemed to do was set the stage for my letdown in the World Series. Or so I thought. Just like we had done all year, we chose to keep fighting. In fact, the only reason I was even on the mound in the 10th inning was because we had fought and fought. We were down 7-5 in the bottom of the ninth inning before Albert Pujols doubled and Lance Berkman walked. Then with two outs, down to our last strike, David Freese hit a ball to right field. It was deep but looked catchable, and at the last second it sailed just past the glove of Nelson Cruz…David had just tripled to right to save our season. Tie game. And then just like that, after Hamilton's home run in the top of the 10th, we were right back to another two-run deficit. But my teammates wouldn't quit. Daniel Descalso singled to right, then Jon Jay hit a bloop single to shallow left. We were back in business. Kyle Lohse bunted them over to second and third base, and then after Pujols intentionally walked to load the bases, Berkman stepped to the plate. A double play ball ends the season, while a hit ties the game. He smacked a single right up the middle of the field to tie the game, and after a scoreless top of the 11th, David Freese crushed a shot deep to center field. The ball cleared the fence and landed in the grass to win the game 10-9. We were going to Game 7. 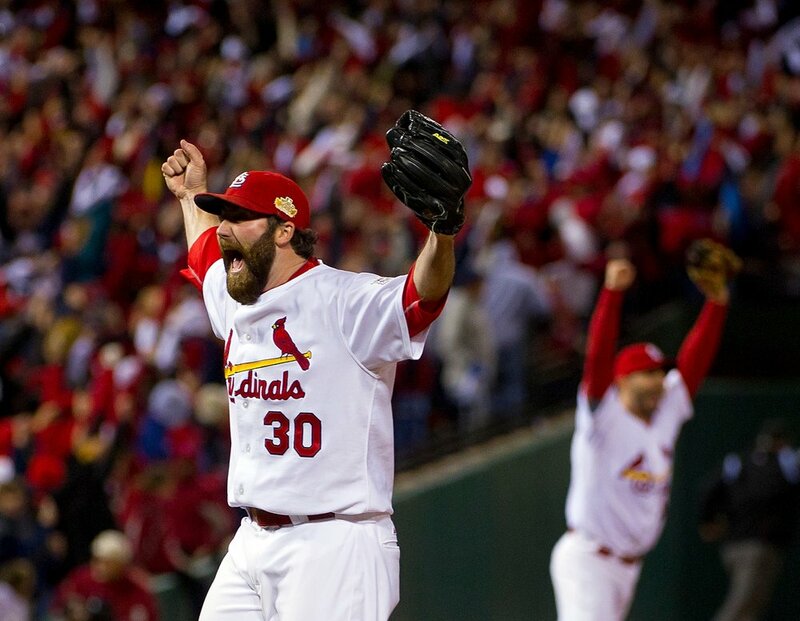 The pitcher for Game 7 would be....you guessed it...Chris Carpenter. We all thought he would come out dealing again, but in the top of the first he gave up three hits and a walk as we trailed 2-0. But Game 7 was a repeat of everything we had learned over the whole year. Keep fighting. Carpenter never let up a run for the rest of his six innings, and to no one's surprise Freese tied the game at 2-2 with a double in the bottom of the first. Allen Craig put us up 3-2 with a home run in the bottom of the third, and by the time Yadier Molina singled in another run in the bottom of the 7th, we were up 6-2. The score was still the same in the top of the 9th when Tony LaRussa called for me to close out the game. The guy who gave up four runs on opening day in 2009 was now being called upon to win the World Series in 2011. I'm usually locked in when I pitch, but as I walked out of the tunnel that night, I decided to take it in. This is really loud, I remember telling myself, as I looked out across a sea of red. I remember we already had one out when a ground ball was hit to Daniel Descalso. When he picked it up and I saw the ball flying across the diamond, I remember how quiet it had gotten, and then when Pujols caught it at first it was just an explosion of noise. One more out to go. The last batter was Daniel Murphy, and as he flew out to left field to Allen Craig, I remember looking at Yadi as he came running toward me. The team tackled me and I remember having the guys piling on top of me. It was an amazing feeling, and something I'll never forget. But I don't know that it beats helping kids fight cancer. I don't know that God cares if I closed out the World Series. I do think He cares that I've tried to help those in need. Roberto Clemente once said "Any time you have an opportunity to make a difference in this world and you don't, then you are wasting your time on Earth." I believe that God holds us to a similar standard, and we decided to put that quote on the back of our K Cancer shirts. The mission isn't over yet, because childhood cancer still exists in the world, but I do know this...If those kids showed me anything, it's that you keep fighting.